Over 750 Texas Casino Parties in 2018! Nobody Ever Forgets A Southwest Casino Party! 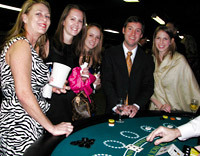 "CASINO NIGHT & CASINO PARTIES"
We supply it all - friendly, entertaining dealers and the finest equipment available; all delivered and setup at your location anywhere throughout Texas. Your guests will have the time of their lives playing at our authentic gaming tables with casino "fun chips". Watch their excitement as they win thousands of dollars in play money at Blackjack, Craps, Roulette, Texas Hold 'em, and more. Join the latest craze. Host your own tournament or offer our newest tables in conjunction with any Casino Night Event. Go “all in” with our authentic full-size oval playing tables and professional heavyweight clay chips. We offer a variety of options from “no limit” to round play that is sure to make your tournament or Poker Night a success!!! 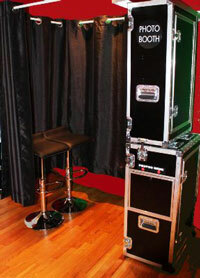 Southwest Casino Productions is proud to introduce the newest addition to our product lines - SnapFlash Photo Booths! Feel free to call or e-mail anytime for additional information or to reserve one of our SnapFlash Photo Booths! "THE CASH CUBE MONEY MACHINE"
Cash Cube can be used with Coupons, Fun Bucks, or Real Money! 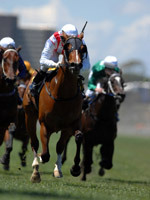 "Race Night" Derby Parties are an exciting, audience participation game played with filmed horse racing shown on a giant video screen. Watch as the horses parade to the gate and the announcer gives the pre-race favorites. Place your bets (with play money of course), sit back and enjoy the calling of the race, and collect your winnings after the race! "Race Night" is your "Winning Combination" to an exciting, fun-filled program! Take your party to a new level with a creative, personalized "Computer Slide Show". We will take digital Photos of your attendees (200 to 300 photographs), set them to music and show the program on a large 15' screen, during your event. You will receive all photos and the slide show on CD. Don't miss out on this exciting new service. It's sure to be the hit of this year's party! © 2019 Southwest Casino Productions, Inc.